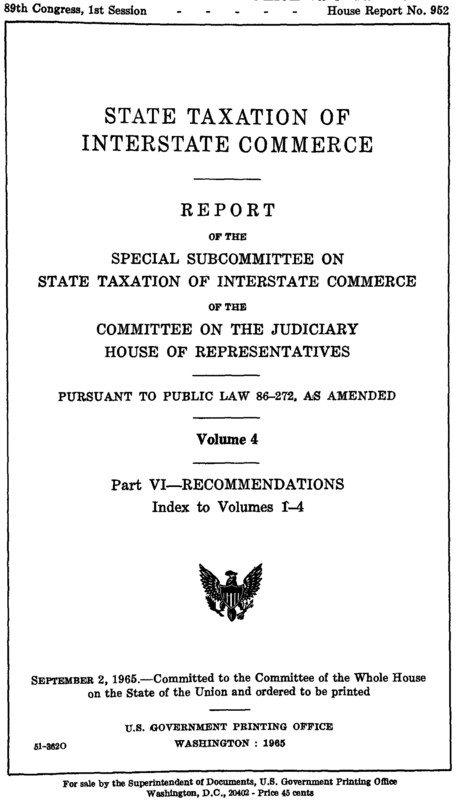 On this day in tax history, September 2nd, 1965, the Special Subcommittee on State Taxation of Interstate Commerce released the final volume of its four-volume study on issues pertaining to multistate taxation. That is a real mouthful, and so the report quickly became known as the Willis Commission Report, after Representative Edwin Willis (D-Louisiana), who was the chair of the committee that authored it. Weighing in at 1,200+ pages, the report itself is far from beach reading. 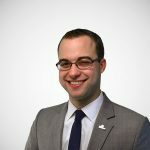 But the findings in it thoughtfully address some of the most pressing issues of state taxing authority of that decade, and still provide us with many useful takeaways for multistate tax problems we face today. Though not a lot of policy wonks have even read it (and I can’t even find a free copy of it online even though it is part of the Congressional Record), it plays an integral role in state tax history. Modern state tax revenue instruments were still in their relative infancy in the ’60s. State corporate, and individual income taxes had mostly come about in the 1930s, and some problems were starting to emerge as states pressed their luck with trying to tax activity outside their borders. Just a few years before, the Supreme Court had handed down the Northwest States Portland Cement Co., 358 U.S. 450 (1959) decision, which had ruled that there was not much limit the Court was willing to enforce on what states could consider as nexus, or sufficient presence of a business within a state for the state government to justify collecting taxes from them. Concerned that states would abuse this open invitation to start reaching across state lines for revenue, Congress quickly passed Public Law 86-272 as a stopgap measure. Among other things, the law 1) allowed businesses to send salesmen out into other states to create orders for shipment without their company having to pay income taxes in those states, and 2) created the Willis Commission to further study these emerging issues with hope to pass more thorough interstate tax laws in the years to come. After years of deliberation, the Willis Report was released in two installments in 1964 and 1965. It covered all the major tax types: corporate & individual income, sales, gross receipts, and capital stock taxes. In the corporate income tax section, suggestions are similarly sweeping. The report suggests significant uniformity, such that almost the only tailoring states could do to their corporate taxes would be to change rates. Charles McLure covers these suggestions well here on page 335. One Willis Commission suggestion that I’ve been fond of for some time was to mandate uniform Be sure to read our short primer on apportionment here. Fearing this property/payroll uniformity proposal might gain steam, states tried to convince Congress that they could address these uniformity issues by working together without an imposed federal solution. They formed the Multistate Tax Compact, and chartered the Multistate Tax Commission, which still exists and at least in theory is supposed to promote uniformity among states that sign onto the compact. Many states additionally rushed to adopt the standards of the Uniform Division of Income for Tax Purposes Act (UDITPA), a 1957 model law that established a uniform apportionment formula based on equally-weighted parts sales, property, and payroll. To some extent, states successfully stalled Congress until state tax uniformity was no longer at the forefront of issues facing the nation. The last installment of the Willis Report was released in 1965, which is the same year that saw the introduction of the first American combat troops in Vietnam. Representative Willis himself was an ardent anti-communist, and actually served as the chair of the House Committee on Un-American Activities from 1965 to 1969. He left office in 1969, and died shortly after in 1972. The “temporary” Public Law 86-272 remains current law. With the threat of federal action gone, many states have since abandoned the uniform apportionment formulas laid out in UDITPA, and have increasingly moved to apportionment formulas based entirely on sales. Though the state corporate tax conversation has not been as hot on Capitol Hill in recent years, parts of the state taxing power debate are still playing out at the federal level. The Marketplace Fairness Act and the Remote Transactions Parity Act, which would establish federal standards for the state collection of sales taxes on online purchases, are just the modern battleground in the question of where state taxing power begins and ends. I don’t pretend to support all the proposals in the Willis Report, but it should be respected for its attempt to comprehensively simplify and unify state tax systems at the time. Protecting against state tax authority overreach is still an important pursuit, and one we’ve written a lot about. If you are interested in learning more, I’d recommend my colleague Joe Henchman’s spirited defense of the physical presence standard for nexus.